A Scrapbook of our lives as Sproutpeople. We hope you enjoy this little photographic history of our lives. 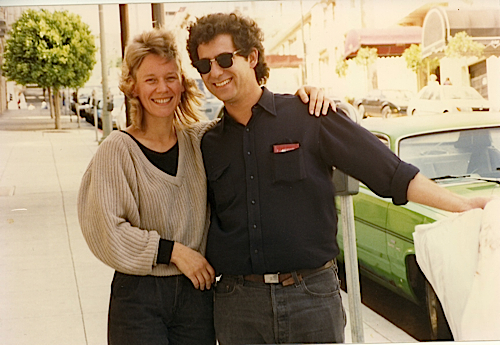 Gil and Lori meet in San Francisco - two young(ish) 80's people. 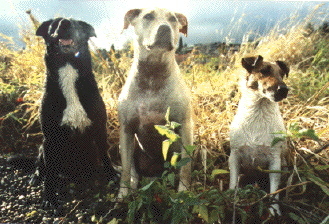 Our 3 dogs (from left) Jupiter, Clementine and Fagie at our favorite play area, a lake in Seattle in 1990, long before kids or sprouts were even imagined. We credit Jupiter with motivating us to get agricultural and go back to the land, because she so loved nature that we found ourselves appreciating it more than ever. Jupie and Clem are originally from the San Francisco SPCA. Fagie (pronounced faygee) was a stray in Seattle. The original name of our farm/business was Jupiter's Farm, which gave way to The Sproutpeople in 1994, though we still credit Jupie as the true founder. On our way to Southern Illinois. After discovering gardening - we put in a garden bigger than our house when we lived in Seattle - we were so impressed with how much food we could produce, that we came around to the realization that we could grow our own food instead of going to work to earn money to buy food. We started reading books about homesteading, and before long we sold our house and moved sight unseen to Southern Illinois in search of self-sufficiency. The cats hated the trip, but the dogs loved every minute, and life on the farm was perfection for them. We had a beat old house, but it sat on 40 lovely rolling acres in the Shawnee National Forest, had 2 ponds, a creek and a huge maple tree in back. God knows we all needed its shade during the amazingly hot summer. The girls lived life without leashes and limitations, and we worked our butts off. We put in two 1/4 acre gardens, fixed up an old shack and filled it with a dozen chickens and a couple goats. We were always together. This was living! Lori and one of our gardens - just plowed. Not many months later - see how our garden grows. Our goats April and Rosebud, ready for dinner. Our 40 acres was amazingly diverse. Here we are on some of the less tillable, coal land. Southern Illinois is coal country. We didn't mine it, but the woman we bought it from had had some mining done - which left odd formations in some places. We were destitute in Southern Illinois. The books we had read in Seattle told us about self-sufficiency and all, but they hadn't prepared us for everything - like we had enough money to buy our homestead, but we had nothing left after that. We couldn't generate income there unless we sold produce (but the farmers markets were too far away and too small), got jobs at Wal-Mart (No Way! Minimum wage and too far away anyway), or worked in the biggest industry in the region - prisons (there were dozens - including a maximum security one in Marion). We loved our land and we loved our life there, but we wanted to have kids and Creal Springs/New Burnside Illinois (we lived between the 2) was too remote, and too damned hot in the summer - and we just couldn't make any money - and we had to before we could afford to be self-sufficient. So, we packed our things up again and moved to Wisconsin (though we did go and investigate before we moved everything this time, and actually had a place to stay - though it was just to pitch a tent - which we lived in for 6 weeks). We were so happy to find actual paying jobs! Our first job? Picking apples. The hardest job we would ever do! Gil and Lori move to Wisconsin, land of giant beer cans. Where it all began. Our 600 square feet of un-insulated, wood heated, solar powered, outdoor plumbing only cabin on 40 acres in the Crow Hollow area of rural Gays Mills, Wisconsin. Specifically - Walker Road at the southern edge of Haney Township. Sam was born in August of 1993. We had been growing sprouts and selling them at market since May or June, but we were still growing and selling vegetables as well. Here Sam is getting a gardening lesson from Gil. Oops. He fell asleep. In the old days - before packaging sprouts became necessary and we were a completely bulk operation, we grew our sprouts outside when the Wisconsin weather permitted. Here Gil rinses the weeks wholesale and market crop. That watering can was our water delivery system in those days. The location, near our very deep (in excess of 400 feet) well was perfectly shady and though the lack of control in growing outside posed many problems, it also provided many great additions - for example - rain would do our watering for us on occasion, air circulation was perfect and it was a beautiful spot to grow plants. Sam was always in the garden or at the well with the sprouts. There was nothing like spring and summer - we were all outside all the time. Sam Easy Ridin' at the Market. Sam grew up with sprouts and at the farmers market. He knows how to have a good time, and liked to amuse people, even as a baby. When the weather turned cool the sprouts moved back into the cabin. By this point they demanded about 25 percent of our floor space - you can see the rack behind the couch where Sam, Dziga the cat, Jupiter and Fagie are napping. This is another view of that portion of our cabin devoted to sprouts. You can see our racks better here. They were built by the remarkable renaissance man Dave Zilavy, who as you may have read is responsible for making sprouts fit into our life by making our market table, our grow racks and our transport racks - for multiple vehicles we used over the years. Gil and Sam, who doesn't currently have quite the appetite for sprouts that he did in 1994 when he tried to put us out of business by single handedly eating all of our profits. We loaded the van with sprouts and greens and headed off to market early on Saturday morning. Carrying a sleeping Sam down and gently laying him in his car seat was the last task before hitting the road. Sometimes he'd wake up on his own and walk down - and talk all the way to Madison. He was always a kick! For the most part he slept on the pre-dawn, 90 mile ride. He has always been wise too. Lori, Gil, and Sam with our friend and faithful sprout lover visiting from Australia, Kathy. Lori grinning through sleep deprivation after the market. Sam is sleeping on her lap. The sprouts were way too many to live in our cabin for another winter, and we were cramped. We saved money diligently and built an addition to our cabin in the summer and fall of 1995. As always it was nip and tuck - we didn't get the doorway cut - so we could walk from the cabin to the addition - until Thanksgiving. It was plenty cold by then and the sprouts had to get out of the cabin. Sam was eager to help. In the Summer and Autumn of 1995 we built an addition onto our 600 square foot cabin. The sprouts needed a new home with more climate control and a better water supply. We still had to get water from our pump 100 feet down hill, but we used a hose instead of hauling it in jugs. We also tripled our solar panels and added the ability to run 1500 watts at once (we had only been able to run 150 watts previously). Though it was only a sump-pump in a barrel that drove the water out of the hose, this method of rinsing sprouts seemed amazing - after years with the watering can. Little did we know at the time that the sprouts would need substantially more space and technology in the very near future. We bought the old post office in downtown Gays Mills and got it fixed up for sprouting. Life can be such a laugh riot. Timing is everything, and though we were financially freaked out, we did enjoy our home with no sprouts in it. It seemed HUGE! Among other things - numerous other things - we needed boxes to transport our packaged sprouts in. Sam helped us when we received a shipment of boxes. To the left you see bags of seeds that arrived the same day. It was one of many thousand busy days at the Sprout Factory. Two of our early market employees, Deirdre and Teresa freed us up to shop around the square. In the Winter of 96-97 we were forced - by snow and overwork - to move our home - into the sprout factory. We provided this picture to a co-op in Minneapolis, Minnesota for display. Behind us are Greens and Grasses on one of our sprout racks (this one was used exclusively for soil plantings). We are holding examples of several of our packaged sprout varieties. Sam is a market kid. He spent hundreds of Saturdays at the Dane County Farmer's Market (voted by multiple publications as one of the very best in the US) - starting when he was 2 months old. Sam was born during our first market season. He grew up at market, where he loved to take Gil or Lori around the 1/2 mile square or trek through the State Capitol. He knew many of our customers names, visited every dog that passed, and played in the fountains (and fished for wishes). Sam has always been an awesome dude! Lori tends the stand during a chilly Spring morning in madison, WI. This table served us for years. It was built from a cheap hollow door and leftover pine boards. We painted it classic market green. We helped design it - actually we just proposed the tiered shelves and the under table storage - it was built by Dave Zilavy, a friend of ours that is responsible for designing and constructing our growing and shipping racks as well. In fact - if it weren't for Dave (who happens to be a childhood buddy of one of our all-time great employees Carl) we may never have gotten off the ground. He built our foundation as it were. Thanks Dave! Theresa W., the funniest helper in the world, kept Lori entertained. Theresa also came up with several of our finest sprout recipes, and used to do demos at the stores we sold to. She was also the person who brought Nick the cat into our life. She was dynamite! Thanks Theresa! Just another picture from the farmer's market. The only thing special about this one is that the table which our sprouts are on is new. We replaced our 5 year old hollow door and pine table with an identical table made of cedar. It is beautiful and weather tolerant but we probably should have used oak (the cedar is soft and bruises easily). The summer of 1998 was very difficult for us. We parted company with our 2 key employees after we discovered they were stealing from us and telling lies about us in our small town. Gil started working 16 hour days and would go 3 days without seeing the kids awake. Lori took care of the kids constantly and did all of our bookkeeping and redesigned our mail order department. We were planning a 400 thousand dollar expansion (a very alien concept for bohemians like us) as the torrent of bad press about sprouts started to pour down - eventually killing the expansion idea. We made it through, but it wiped us out. By years end we were virtually useless and if it weren't for our loyal employees we would have surely given up. A person can only work so many 80 hour/7 day weeks. For us the limit was 5 1/2 years. But hey - I'll put down the violin. You get through the hard spots. Keep enjoying all you have. Alice is our daughter. She was born in September of 1997. Alice was a market baby, like her brother Sam. They spent every Saturday from Late April through early November in Madison at the Dane County Farmer's Market, rated one of the top 2 or top 5 (depending on what you read) farmer's markets in the US. It is a great addition to all of our lives. Lori and Gil are basically urban people (one of Gil's favorite job was driving cab in San Francisco) who lived rurally from 1991 - 2003. We love our home and the town in which we live, but we are very happy to have a day in Madison to help us balance our lives - and our children's. As you can see, Alice and Gil are soul mates. Theresa W. keeps the sprout stand in order while Lori bags 'em up. Carl was one of our longest tenured employees. He grew more tons of sprouts than can be imagined. When he came to us he was 5 ft 2 inches tall and weighed 71 pounds, now, years later, he is the buffest dude in town. Carl also happens to be one of the very funniest people on Earth (Take it from Gil, he used to manage a comedy club in San Francisco) and we felt very fortunate to be his audience. If he was doing his schtick in L.A. he'd have been wooed away from us long ago. Gil trained quite a few sprout growers in our time, but Carl was the best of them all. We had quite a few market helpers over our decade at the Dane County Farmers Market. When we first met Rachel she was working at Whole Earth Co-op in Madison. When that co-op passed out of existence she moved to Mifflin St. Co-op (our 1st wholesale account) to work in the produce department. Rachel had been co-oping as long as we'd been sprouting, probably longer. Every other Saturday she provided our customers with service and cooking suggestions while we wandered around with our kids or chatted endlessly with long time patrons. Thanks Rachel! Our kids grew up eating sprouts. Alice loved them then and still digs in nowadays. As a baby, she was at least as sweet as she looks here, but ooooh what a temper! This is Spring 1999 before she entered the Horrendous Twos. On the weeks Rachel wasn't with us, Jody was. When we first met Jody she had been with Mifflin Street Co-op in Madison (the coolest - most politically active co-op, and our first wholesale customer) for 12 years. At this point in time she worked in a governmental capacity at the University of Wisconsin promoting co-ops. She helped us every other Saturday with our several hundred weekly customers, most of whom it seems knew her. Actually - she pretty much ran the show while we walked around with Sam and Alice, ord fumble around with baggies and twist-ties. We did get up at 3AM and drive 100 miles to market - so we really did need the help - big time. Thanks Jody! We were put in this position by a local photographer. I think it the best picture ever taken of us with sprouts - though Lori wishes I'd take it off our site - and it is the only one that a photographer has actually ever provided us with. They all say they will as they click away - but they never do! Take it from Gil - he grew up with one. Thanks to Terry Noble. Early in 2000 we moved our seed business up to Viroqua, where we then lived. We rented the retail space in front of a welding shop, right on Main St. We didn't sell direct (a retail shop selling sprouting seeds is not really a business that would last - even in San Francisco, where we moved in late 2003), but Viroqua was a small town with more space than retailers, so it could stand us there on Main St. Our landlord, the fantastically amusing Mark Dunham - who was a hell of a welder - let us break through his exterior wall so we could put in a door big enough to move palettes of seed through, and he footed the bill for a new ADA compliant bathroom. He also let us put a kitchen in the back, and he or his welder Roger would run their forklift for us when we received seed deliveries. 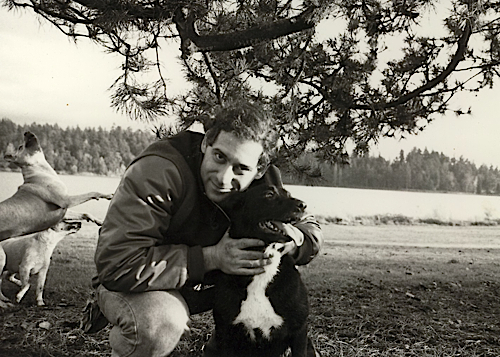 Besides being a truly memorable man, Mark was responsible for bringing our cat, Neville into our lives. Thanks Mark! When we moved our seed business up to Viroqua, and sold the non-market part of our fresh sprout business in Gays Mills, we began to grow our farmers market sprouts like we had in the old days - outside. We built our growing tables (wooden palettes with longer legs in back and shorter legs and lips (to keep the trays from sliding off) in front) for our leafy sprouts, grass and greens. The buckets you see were used for growing bean and grain sprouts. We drilled holes in them, turning them into 5 gallon sprouting devices. They are scattered because this picture was taken after the finished sprouts were transferred to trays - which was how we took all of our crops to market. A chilly May day at the Dane County Farmers Market. Gil is behind the stand taking this picture. No doubt Jody or Rachel are also there - doing all the work. Gil has spent more years staring at computers and keyboards than a sprout guy should, but how else are we to share what we have learned? From fall of 1999 - September of 2001 Gil was up almost every night until 1 or 2 AM, writing everything we had learned about sprouts and sprouting, and designing a web site. When that site went live (September 21, 2001) he was so sick of web work that he ignored the site as much as possible. As the years passed, the site at sproutpeople.com served well, helping instruct many about sprouts and sprouting, but the shopping cart grew out-of-date, and its idiosyncrasies became a drag for us at work. In 2008 Gil found a web designer and began working with them to re-build the site. Sadly they weren't the right designers for our site. Months passed but the work didn't move forward. In the end - 2 years after paying them, Gil completed the site with the help of independent web contractors. He edited our content (the text on our site), took and added thousands of pictures, spent months writing HTML, and taught himself how to do all sorts of things he never wanted to know. But, education is a wonderful thing, and so is perseverance - and there is nothing like finishing a project. If you are reading this then the project is done. We hope you like it. As with all things to do with Sproutpeople - it has been a labor of and expression of our love. Lori spent a whole lot of time at Sproutpeople in 2010. Not that that's anything new, but with me (Gil) toiling away on the web site, someone had to pick up the slack. Lori was happy to work the extra hours, though I think she's also happier than anyone to see the new site up. Kate has been working at Sproutpeople since the spring of 2009. She is our first full-time employee this millenium. We love having her with us - she is an amazingly great manager. She oversees everything to do with production at Sproutpeople, and fills more orders and answers more emails than anyone. Kate is a marvel. We hope she is a Sproutperson forever. at one of the best markets in the world!